Summer is quickly coming to an end and the flood of people in Berkeley means school is starting soon. Summer in the Bay Area is pretty amazing, especially when they are not as many people waiting for food at a restaurant or a ton of people packed inside a BART train. It feels a little bittersweet to let that go and to jump into Fall when I have so many dresses to wear, but at least I have cute boots and coats to wear. For today's post, after experiencing Caltopia again, I thought I'd pay an ode to my alma mater and its school colors. I found this cute striped watercolor skirt at Crossroads Trading Co. and instantly fell in love with the colors! 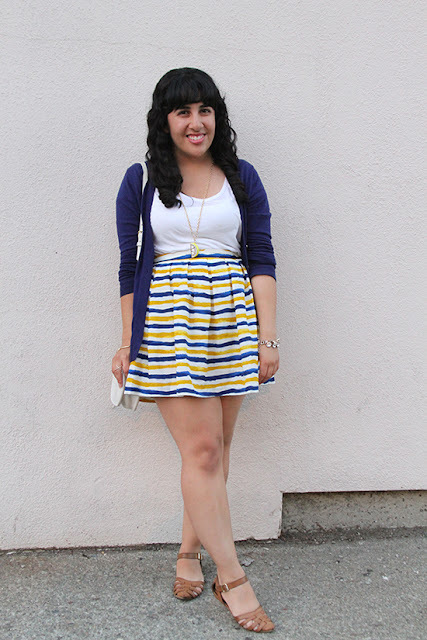 I paired it with a classic white t-shirt and brought out the shades of blue with the navy cardigan. I feel I have been really into skirts that are slightly high-waisted, but I love how casual this looks with a simple T. I can see myself repeatedly wearing this T-shirt more often than the skirt, which is one reason the skirt is currently available for sale in my Poshmark closet. 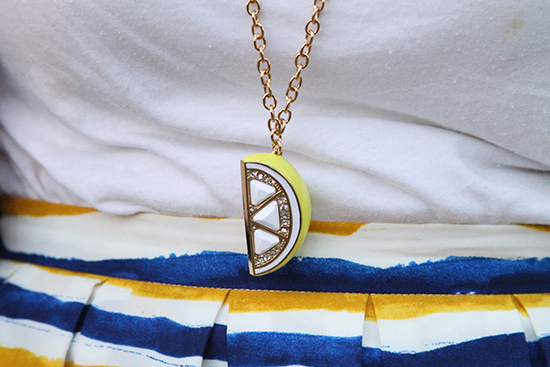 I tend to go a little overboard when I am notified of a Kate Spade Surprise Sale, so when I saw this lemon pendant, I knew it was joining my closet along with a matching lemon coin purse and a crossbody bag! This is a fun, eclectic piece, and I felt it would be an unexpected element to add with these blue and gold colors. Hope you are having a great start to your week! I am so excited to be counting down the last few days I have as a 24-year-old! 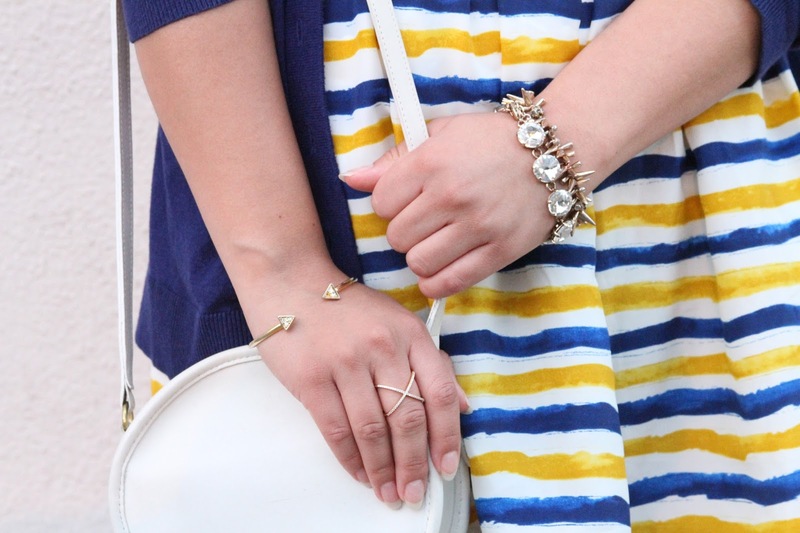 I need to evaluate where I am with my goals set for my last birthday, but stay tuned for a fun outfit post!